Every year on 19 November, World Toilet Day is a chance to get involved in the global movement for toilets and sanitation for all, and raise awareness of the need for action to end the sanitation crisis. 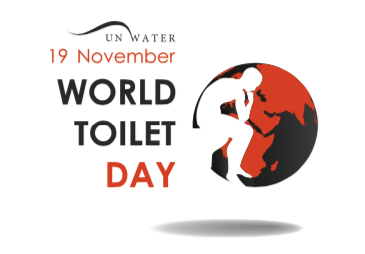 In 2013, 19 November was designated as UN World Toilet Day. The theme for this year’s World Toilet Day is dignity and equality, inspiring action to end open defecation and putting a spotlight on how access to improved sanitation leads to a reduction in assault and violence on women. Sustainable sanitation is a matter of dignity, equality, and safety, and is crucial to improving the health and wellbeing of one-third of humanity. What can you do to help make ‘sanitation for all’ a reality this World Toilet Day? Participate in The Urgent Run or host your own event for this year’s UN World Toilet Day. The Urgent Run (www.urgentrun.com) is a global mobilisation event to draw attention to the urgent calls for action to end the sanitation crisis. Sixteen events have been registered in 12 countries including Singapore, India, the Philippines, Indonesia, Ghana, Italy, Senegal, and Mozambique. If you can’t wait to see health, dignity and wellbeing for all through sustainable sanitation, join The Urgent Run, or hold an event. Hold a big squat and raise awareness of the more than 1 billion people who face the indignity of open defecation, which spreads diseases including cholera, typhoid, hepatitis and diarrhoea. Stop, drop, squat and share! Get friends, colleagues, classmates or family together, invite people in the local community and squat in a public place. Take photos or video, and share them on YouTube, Vimeo, Vine, Instagram, Flickr, Facebook or Twitter. Use the hashtags #bigsquat, #worldtoiletday and #opendefecation. Access to sanitation would make life safer and healthier for 1.25 billion women. Join the global movement for toilets and sanitation for all, and raise awareness by posting on Facebook, Instagram, Google+, posting a Vine or Tweeting this World Toilet Day. Show that you give a crap about toilets and sanitation, and raise your voice to call for action. Use the hashtags #wecantwait #worldtoiletday #opendefecation #sanitation and #igiveashit. Clean and safe toilets are fundamental for health, dignity, privacy, equality and education. Contact your local representative, community leader or member of parliament and let them know you care about public toilets in your area. Does your town need new public toilets? Are the toilets safe and accessible, clean and well-maintained? Is there an appropriate ratio of toilets for men and women, or ‘potty parity’? Talk toilets with your local representative today. Watch a World Toilet Day playlist and share videos on Facebook or Twitter to join the call for toilets and sanitation for all. Here’s one to start with – meet Mr Toilet. Jack Sim is a man on a mission to end the sanitation crisis, and he started by tackling the toilet taboo. Meet the man behind the World Toilet Organization who is proud to be called ‘Mr. Toilet’. 1,000 children died per day from diarrhoeal diseases due to poor sanitation in 2013. These deaths are preventable, but what we don’t discuss, we can’t improve. Help break the ‘toilet taboo’ by talking crap with friends and family, colleagues, classmates or neighbours: have a conversation, send an email, send a text, post to Facebook, and raise awareness of the importance of action on sanitation. Did you know that more people own a mobile phone than have access to a toilet? Next time you go to the bathroom, think about how lucky you are, and snap a #toiletselfie and post it to Instagram, Facebook or Twitter for World Toilet Day – and keep it clean! Let your friends know they’re lucky if they have access to a toilet and encourage them to join the sanitation movement. How will you commemorate UN World Toilet Day on 19 November? Join the call for action to end the sanitation crisis on UN World Toilet Day, and share what you’re doing. Reply to @worldtoilet and @UN_Water on Twitter or email online@worldtoilet.org. Some of the best activities will be featured on the World Toilet Day website and in World Toilet Organization’s social media.